The Border EP Regional Karting Championship completed round two of their championship on Saturday, 13 May. The wet weather on the days made the circuit very slippery during the morning sessions, but it gradually dried out as the day progressed. Karting is an all-weather sport and the rain did not dampen the Karter’s racing spirit and we had very good racing without any incidents. The MSA officials and marshals always play’s a very big role in making sure our Karter’s are safe on circuit. The Border Karting Executive Committee, also welcome Alec and Ryan Gudmanz based out in Queenstown to the club. 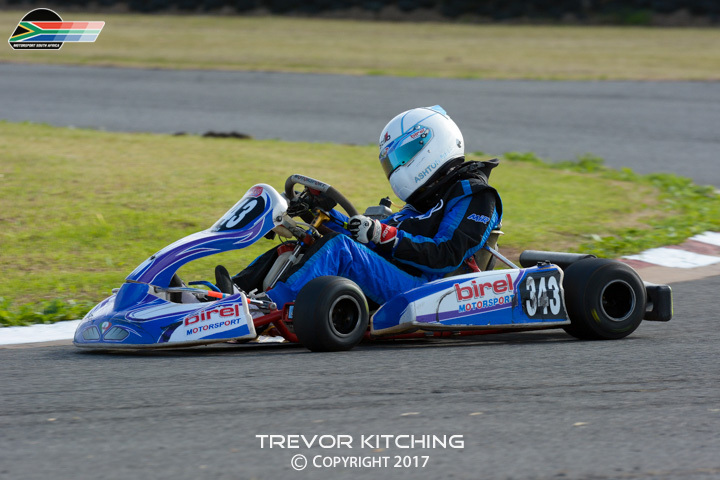 Bryn High joined in on the action from the Algoa Karting Club, Kyle Heideman travelled from Queenstown to complete and the rest of the field were made up of East London based, Border Karting drivers. East London and Buffalo City is establishing itself as the preferred motoring destination in the country, with the African Bike Week, Super GP series, National Porsche Club event, all arriving on our shores at the same time. With all of this happening Karter’s had a two month break in their racing calendar. Despite the long break Karter’s did not disappointment the sizeable crowd that turned up to watch the spectacular racing. Cadets 50cc: 1st Jordan van der Merwe, 2nd Redd Scholtz, 3rd Heath Vallance. Heath was a bit disappointed in giving up second place to Redd, but said he will claim it back in the next round. Junior 60cc: 1st Sebastian Smith, 2nd Kaylim Padayachee, 3rd Jordan van der Merwe, 4th Redd Scholtz, 5th Daniel van Zummeren, 6th Jordan Dorning. Sebastian made his presence felt and finished 1st in all three heats. Kylim and Jordan are very consistent and are placing Sebastian under pressure for that first place. Redd, Daniel and Jordan Dorning are swapping positions all the time and is quickly getting to the same pace as the leading trio. These young and talented drivers promise to deliver good racing for the rest of the season. Class A: 1ST Jared de Kock. Class B: 1ST Ashton Nel, she made a welcome return to Karting after a short break. Cherne and Melindre Marais, had school sport duties. Class C: 1st Neil Stephen, 2nd Kyle Heideman, Kyle said what he enjoyed most on the day was how the kart went sideways due to the wet conditions. Cuan Flusk promises to make a competitive comeback in round three, after race preparations did not go as planned. 1st Geoff Stephen, 2nd Bryn High, 3rd Shaun Gradwell, 4th David Burberry, 5th Craig Borges, 6th Brent Strydon, 7th Jared De Kock, 8th Kevin Vosloo, 9th Blake Kruger, 10th Tristan Wantenaar. Notably absent from the starting grid was Richard Clarke. All indications are that he will return to Karting shortly. Geoff Stephen, dominated all three heats and made some spectacular overtaking manoeuvres, he is slowly carving his name in the book of Karting Legends, speaking to his Dad afterwards, Geoff was just coming out of diapers when he sat behind the wheel of his first go-kart, all this time in the seat definitely shows on the track the class of driver he is. Bryn and Shaun followed within split seconds behind Geoff, and the slightest mistake would have costed him dearly. David got rid of the gremlins from round one and finished a respectable 4th and scoop Driver of the Day award. Craig normally finishes within the top four, the long break could have played a part in his performance on Saturday, but never write him off, he will bounce back. Brent kept a consistent pace and had a good 3rd heat. Jared made his debut in this very competitive class with a very respectable finish. Kevin, Blake and Tristan are enjoying each other’s company and are having some good battles down the order. Saturday morning 11 March greeted Border Motorsport Club with a glorious sunrise and great weather for round 2 of the Regional Circuit races at the East London Grand Prix Circuit. We welcomed our guest competitors who cam from as far afield as Cape Town, George , Johannesburg and Jeffreys Bay. The Port Elizabeth contingent of Bikes and Cars were there in force and as always they were very complimentary about the hospitality on their east London hosts. The races were fast and furious, with an Easterly wind blowing ever stronger as the day progressed making it very challenging especially for the bikes as they turned in for Potters Pass, one of the fastest corners on any circuit in the Southern Hemisphere. The bikes category saw a huge contingent of 600 CC machines campaigning for top honours and in fact the racing was so much more competitive and attracted many newcomers to this series. 600 cc bikes are cheaper to buy and to maintain and tend to be very equally matched. Two “Girl racers” Zanté Otto from George and our own Cassidy Simmons put up some stiff competition mixing it with the seasoned guys . It was a great spectacle to observe. It was also amazing to see the young bikers , (names) who have migrated from the Honda NSF challenge to the new Honda 125 and KTM 390 series taking to the big circuit . What a wonderful job Robbie Brakespear and his sponsors are doing developing these young people to become racers. The Dunlop Historic Regional challenge saw 38 cars on the grid with a collection of amazing Historic cars ranging from a bevy of 1600 Ford powered Escorts, Anglias, Cortinas Capris and a monsterous Ford Fairline V8, a V* Chev Can-Am, campaigned by Queenstown Pharmacist , Derek Boy, who had a great tussle for 1st place chasing the 2 Ford Capri Peran V8’s of Darron Gudmanz and Ryan Boy. The flame spitting Mazda Capella Rotary of Matt Gudmanz. looked spectacular as he entered Potter pass with a huge flame of un-burnt fuel flashing out of the huge exhaust of that finely tuned Rotary motor. A good turnout of Alfas were involved in the dice for honours. Always a great to see and hear these “Italian Stallions” on our circuit. The modified saloons included some fantastic cars like. Open top Lotus 7, BMW 3 series, a “Brat Pack” of Golf 1’s, Opel Monza, Kadett, the thundering class A Chev Corvette V8 piloted by Bevan Swartz, and the Mazda RX8 rotary. Thanks to all our sponsors, Dunlop Tyres, Border Towing & Recovery, spectators, competitors and officials. The Sasol GTC Championship visited the East London Grand Prix circuit this weekend for the final round of the series. Once again, action was frenetic around the dauntingly fast 3.9 km track nestled next to the Indian Ocean. The day proved a fitting end to the inaugural GTC series with action throughout the field in both ten lap races. Champion-elect Michael Stephen duly drove his Engen Audi A3 GTC to a troubled fifth and ninth place respectively in the day’s two races, earning the points required to claim the overall title and was rewarded with a well deserved R200 000 cheque as the 2016 Sasol GTC Championship winner. This championship incentive will be remembered as one of the biggest in South African motorsport history. The weekend didn’t get off to a good start for Stephen, suffering a blown engine in Free Practice one on Friday morning. A loan unit from their sister company Volkswagen was secured for the Audi, and he went out and claimed a dominant pole position, ahead of his team-mate Simon Moss. The Sasol GTC Racing Team locked out row two with Gennaro Bonafede shading Hennie Groenewald, followed by the two Volkswagen Jetta GTCs of Mathew Hodges and Graeme Nathan. Stephen spun trying to avoid ramming the VW ahead allowing Bonafede and Nathan to race past the spinning Audi. Hodges out-braked Groenewald at the final corner going into the final lap while further up the road, Moss’ engine broke with four corners remaining. Lady Luck favoured Hodges who fended off Groenewald to claim his and Volkswagen’s first Sasol GTC championship victory. Nathan crossed the line in third place followed by Bonafede and the recovered Stephen. Race two, minus Moss who was sidelined for the rest of the day, saw Stephen bolt into the lead while the field settled in behind him. Going into Potter’s Pass, Nathan nudged Hodges who spun to the back of the field. Bonafede and Groenewald followed through, with Nathan and the GTC-Production car field in tow. By lap seven, the only Audi in the race was missing with Bonafede now leading Groenewald and Nathan. Stephen had an electrical issue that saw the engine cut out every time he changed gears and he quickly dropped to the tail of the field. Nathan brought his Jetta home in third place again, followed by Hodges. The Sasol Turbofuels™ Plus-backed Groenewald and Bonafede earned another one-two on the day’s overall standings, followed by Hodges, Nathan and Stephen. In the GTC Production Class, Charl Smalberger took the first victory in his VW Golf GTi, ahead of the 2016 class champion Daniel Rowe in his VW Motorsport-entered Golf GTi. They were followed by Devon Piazza Musso (Kalex VW Golf GTi) and Mandla Mdakane in the second factory Golf. Rowe re-asserted his authority in this class by taking his 11th victory of the season in race two. Smalberger and Piazza Musso completed the GTC-P podium. Reflecting on the first season of the Sasol GTC Championship, Dean Somerset, Manager: Marketing, Sponsorship and CSI of Sasol Energy said: “We celebrated a year of high tech racing which is synonymous with Sasol’s product offering and encapsulated in our DNA. The series shows the potential to grow in stature and maintain its status as the premier circuit racing championship. I commend the teams, associate sponsors and GTC management for their efforts in staging the first Sasol GTC Championship season”. GAS Sports have announced that a round of the SuperGP Champions Trophy will form part of Africa Bike Week™ for the next three years. Over the past three years the SuperGP Champions Trophy has grown and is now firmly established as the premier motorcycle racing series on the South African calendar with many of its stars going on to showcase their talents on the international stage. After 8 years in Margate on the KwaZulu-Natal south coast, Africa Bike Week™ which, among other things, hosts the largest mass ride in Africa is moving to East London from 2017 and will take place from Thursday, 27 April to Sunday, 30 April. The Eastern Cape SuperGP will take place in the middle of this on Friday, 28 April and Saturday, 29 April. We had about 25 entries ranging from 4 cylinder front wheel drive Golf 1’s to 5 cylinder all-wheel drive Audi, 6 cylinder Nissan’s and BMW’s to the ultimate champion…the Nissan GTR 35 driven by Gordon Nicholson and Viswa Williams. The GTR’s had a strong battle the whole day, but at the end it was Gordon Nicholson taking it in his Blue Nissan GTR 35. Gordon’s fastest time on Saturday was 10.803 seconds, but his fastest time for 2016 was a 10.6 second ¼ mile. Viswa managed to get down to 11.038 second ¼ mile in his Black Nissan GTR 35. Viswa showed immense improvement, so next year the heat will be on Gordon to defend his times. We would like to take this opportunity to thank all the competitors and spectators for all the support during the year. We have managed to build up a great sport in East London and 2017 will be even better. Also a massive thanks to Border Motorsport Club for all the support and guidance and for making these events possible. The Border Motorsport Club Speed Weekend was ended on a high note on Sunday, 14 Aug, with the conclusion of the BMSC Top End Run event. The 2016 Simola and General Tyre sponsored event, saw a record number of entries since the inauguration of the BMSC Top End Run in 2014. Competitors in the Top End Run starts 50m before Beacon Bend, and accelerate as quickly as possible up the ELGP circuit main straight, to the finish line a 600m where the competitors top speed is measured as the result of the specific run. Competitors took part in two rounds, after which the top 25 went through to the elimination and final rounds. Craig Zank from Klerksdorp in a Nissan GTR R35 was back to defend his 2015 title, with main opposition expected from Simola Hillclimb winner, Des Gutzeit in his purpose built Nissan GTR R33, Border’s own Darron Gudmanz in a Nissan GTR R35, and the BMSC TER 2014 winner, Martin Van Zummeren in his Nissan GTR R34. Another draw card entry from veteran motorsport legend Peter Lindenberg, and his daughter Paige, in a new Ford Mustang Shelby Cobra. A very impressive collection of high speed machinery gathered in the East London Grand Prix circuit’s pit area, to start the top end runs at 10h30. Apart from purpose built hill climb and drag race cars, entries also included cars like Lamborghini, Mclaren, Mercedes AMG, Chev Lumina, Nissan GTR’s, Porsche GT3’s. Border Historics were also well presented with some old school American muscle, by Selwyn Blom and Brett Franklin in the awesome sounding, and very powerful Ford Capri Perana, and Ford Granada Perana. After a busy day of racing, the results were concluded with Wade Wright in a Honda Type R claiming the 4-Cylinder class at a top speed of 176km/h. The 4-Cylinder Turbo class was won by Wesley Swartz in a Honda Civic at 200km/h, after some close competition from Matthew Gudmanz in his Golf GTi at 194km/h. The 6-Cylinder class was won by Quinsley Sale in a Porsche GT3 at 209 km/h, followed by Bets Radloff in a Nissan 350Z at 187km/h. In the Open Road going class, Craig Zank’s Nissan R35 GTR took first prize at a 264km/h, followed by Bevan Choudree a 226km/h in his BMW M5, and Alec Gudmanz at 225km/h in a Audi R8. In the Racing car class, a new record top speed was recorded by Des Gutzeit in his Dezzi’s Nisssan R33 GTR, at 287km/h. Gutzeit was also crowned as the 2016 BMSC Top End Run Champion. In second place was Darron Gudmanz in his Nissan R35 GTR at 263km/h, followed by Martin van Zummeren at 249km/h, in his Nissan R34 GTR. First place prizes of R10,000, and R15,000 was awarded to the winners of the Open Road, and Race car categories respectively. In an extraordinary show of sportsmanship and loyalty to motorsport, both Des Gutzeit, and Craig Zank donated their winnings to the Border Motorsport Club in support of local motorsport. The Extreme Festival rolled into East London on Saturday and was given a warm reception by the hordes of spectators who flocked to the historic East London Grand Prix Circuit. Competitors revel in the high speed challenge of the fast flowing circuit and the VW Polo cup is arguably the most competitive class in South Africa. A field of 19 competitors made the trip to the coastal circuit. Unfortunately only 18 made it to the starting grid on Saturday morning after Kuda Vazhure rolled his Polo in spectacular fashion during practice on Friday in the Esses complex. He emerged from the wreckage unhurt, but the car was beyond repair in the timeframe of the weekend. The new Polos built this year are far quicker than their predecessors as Keagan Masters proved with a pole position lap more than three seconds faster than the pole position lap last year. In the first race it was the master category driver Shaun la Reservee who held off the hard-charging young guns to take victory. Second went to Matt Shorter with Bradley Liebenberg in third. Championship leader Keagan Masters had to settle for fourth place. In heat two the roles were reversed and it was Liebenberg who came away with the victory ahead of La Reservee, who was once again the first Master category driver. Tasmin Pepper put in a storming drive to take third place. The Formula 1600 cars are always great to watch, as they are purpose-built race cars with open wheels. Drivers push the limits with their wheels just millimetres apart at speeds in excess of 200km/h. The championship battle between the two title contenders gained traction and it was Dewald Brummer who managed to take a double victory on the day ahead of his main title rival Julian van der Watt in second. Alex Gillespie kept a close eye on the action ahead and finished in a solid third overall. The Extreme Supercars class saw a tooth and nail fight between the Ferrari F430 of Jonathan du Toit and a host of BMWs which were determined to spoil the party. After a wet qualifying session Du Toit could only place sixth on the grid behind the Porsche of Sun Moodley with a trio of BMWs determined to make a break from the pack up front. But Du Toit’s Ferrari screamed through the pack and took a hard fought victory ahead of Gianni Giannoccaro in second place and Dawie Olivier in third. In class A in the ZX10 Masters cup, Graeme van Breda take victory ahead of Jaco Gous and Kyle Robinson. Sanjiv Singh took victory in class B ahead of Russ Page and Henk Schuiling in third. In class C it was Pieter de Vos who took victory ahead of Johan le Roux and Teddy Brooke. In the Thunder Bike class it was none other than Travis Naude who used his local knowledge and experience of the circuit to take Class A ahead of Henk Schuiling in second. Nico van der Merwe won Class B ahead of Shaun Vermaak and Gavin Upton in third. Ross McCrorie was victorious in class C ahead of Rupert Fourie. Dean Vos won class X ahead of Gareth Davidson. Mathew Herbert won the ZX6 class ahead of Sandra Shelley. 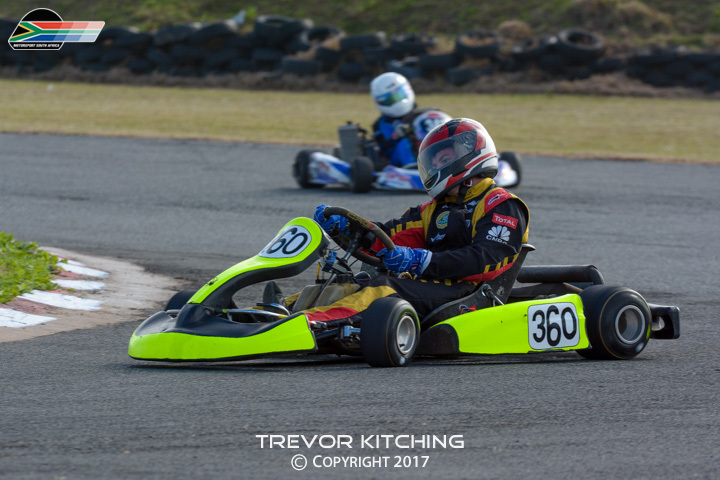 Investchem Formula Ford racer Dewald Brummer (4 – MAD Racing / Ango Trucks / Fuchs Oils) was the lead racer in East London on Saturday, in a weekend that was marked by consistent racing performances, virtually throughout the field. Brummer topped the timesheets at round four of the Investchem Formula Ford championship from qualifying, through races one and two and also took overall first place for the day – as well as claiming the fastest laptime for the day. While Brummer might have been at the front of the field for the entire race day, this does not mean it was an easy event – or any slower than expected. Behind Brummer, Julian van der Watt (42 – Investchem) continued his championship chase, staying close on Brummer’s heels and within a half-second of his results through both races. Van der Watt did lead briefly during the first race, but after he dropped back to second a mix-up in the lapboards displayed left him thinking he had an additional lap to mount a challenge on Brummer and reclaim the lead. In race two, it was Alex Gillespie (50 – Mbotyi River Lodge) who initially took the lead from third place, with an excellent start off the grid. Both Brummer and Van der Watt turned the tables in Potters though, taking first and second place. Van der Watt kept the pressure on Brummer at all times, ensuring that he could not get away at any point, or score significantly more points. 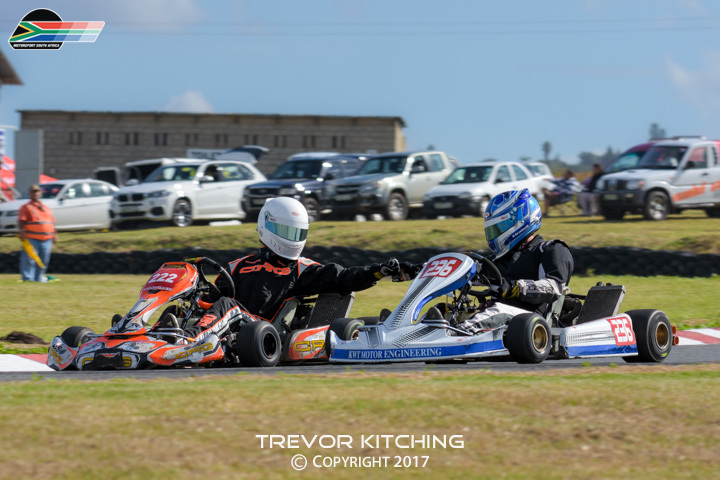 The pair swapped championship positions at the Port Elizabeth round when Brummer took the Investchem Formula Ford lead – but Van der Watt’s performance will ensure that gap remains a small one going into round five. While still a small gap, Brummer has used the East London round to go from a two point lead to eight points – a very hand addition of six points to his total. Behind Brummer and Van der Watt, Gillespie and Dean Venter (77 – MAD Racing/Fuchs Oils/Ango Trucks) were doing their part to ensure the chain remained unbroken. Qualifying in third and fourth place, the pair continued in this fashion throughout race day, to finish third and fourth overall as well. In addition to the regulars, there were a few other faces amongst the Investchem Formula Ford entries at East London. Saul Hack (88) has recently returned to South African and is looking to return to single-seater racing. He joined the field for round four and finished sixth overall for the day. Jonathan Nash (8 – Nash Motorsport / Investchem) made an appearance at round four, filling in for series regular Rick Morris who was unable to race this event. Michael Jensen (98 – Fantastic Racing) and Mark Lauth (99 – Fantastic Racing) both competed in the Investchem Formula Ford category for this first time at the East London round. Both visitors from the Shelby racing series, they took the opportunity to experience competition in this ever-green open-wheel category, completing their race day in ninth and 11th place overall. The Investchem Formula Ford competitors will appear at Zwartkops Raceway next, when the public holiday on August 9 provides the perfect opportunity for another race-day during the week. Perfect weather conditions and an absence of delaying “incidents” set the scene for a thrilling day’s racing in the Expert Tech All-Bike Race Day at the East London Grand Prix Circuit on Saturday when competitors from all over the country as well as from New Zealand tested their skills against the competition in their respective classes. There is no doubt that the Superbike class (1000cc motorcycles) produced the most exciting heats of the day as locals Travis Naude and Travis Warne showed the way around the circuit against Gauteng’s Pieter de Vos and local veteran, Pierre le Roux, but perhaps the star of this battle was young Kevin Redman, from Plettenberg Bay, who presented strong competition to the lead group, on a 600cc Yamaha. Redman emphasised his talent by being awarded the much-coveted “Bearing Man Big Balls Trophy”, which is awarded to the rider who clocks the top speed of the day through the apex of the formidable Potters Pass bend. The strongest contester for the award, Travis Warne, was a matter of 0.2kph slower than Redman, who achieved a speed of 198.816kph. The newly constituted Classic Superbike Racing Association (CSRA) presented its own exciting contest, but with the difference that Gauteng-based veteran Gavin Ramsay showed a clean pair of heels to his opposition, taking both heats in fine style, but behind him, Port Elizabeth’s Remi van den Berg, Gauteng’s Ettiene Louw and Cape Tonian, Tony Jones made their presence felt on pre-1989 machinery that still puts in competitive lap times on this circuit. Bikes of smaller engine capacity contested the Powersport class and produced shoulder to shoulder racing in a field of 15 bikes, with Port Elizabeth’s Paul Jansen emerging over-all victor for the day. In the class for the up-and-coming champions of the future – 100cc Honda NSF – it was 10-year-old Jordan Breakspear who cleaned up in both heats. For the first time, this field of 5 competitors took to the main circuit to show their mettle. The normal contest for this class is on the much shorter karting circuit, but these youngsters showed that they are ready for big competition. East London local riders, Cassidi Simmons and 7-year-old Dante Havenga are new to the class, but showed that they were prepared mix it with the more experienced riders. Round 3 of the Border Karting Club, regional Championship was held at the East London Grand Prix Circuit on Saturday 21 May 2016. The regional status of the event, which is part of a series of races held both in Port Elizabeth and East London attracted drivers from across the region to join the locals in an attempt take home the title of 2016 Eastern Cape and Border champion. The 50cc Cadet Class saw 2015 Border champion and current border championship leader, Kaylim Padayachee extend his lead in the season standings with a near perfect performance to take the overall victory for the day. It was only Port Elizabeth’s Bryce Loenen who was able to stop Padayachee from taking a clean sweep of victories as he took the victory in the final heat to finish 2nd overall for the day. Red Scholtz put together a much improved performance and took home a well-deserved 3rd place trophy, Dylan Stevens and the current 2nd placed driver in the championship, Jordan van der Merwe finished tied on points for 4th place. Port Elizabeth’s Aiden Barnard put together a consistent performance to secure victory in the 60cc junior class. 2nd place was 2015 Border Champion Sebastian Smith and Jordan Dorning came home in 3rd. In the Clubman’s A Class, Border’s top National competitor Shannon Jackson Put together a dominant performance and scored a full house of points for the day. This was despite being pipped to the flag in heat 2, by Kean Barnard. Barnard however was classified as a class B competitor despite running with the Class A competitors throughout the day. 2nd in class was Port Elizabeth’s Cameron Kelly, and 3rd was championship Leader Jared de Kock. Clubman’s B Class was dominated by Port Elizabeth’s Kean Barnard, who will surely be classified in class A for future events as he matched the pace of the top class A competitors throughout the day. Craig Borges came home 2nd overall ahead of 2015 Clubman’s B champion Ashton Nicole Nell who had an eventful day in 3rd. Clubman’s C Class saw 2015 champion Cuan Flusk take a narrow victory ahead of a hard charging Cherne Marais in 2nd while her Sister Melandre Marais came home in 3rd overall. Reigning 2015 DD2 Border Champion Geoff Stephen was too good for the chasing pack in the DD2 class as he took a dominant victory on the day. Shaun Gradwell shadowed Stephen all day, but was only able to follow him home in 2nd. 3rd place went to Craig Borges.